In Sweden the trend is evident: Young people become more and more interested in crafts of the old times and dream of a life in the country. Three of those are Johannes Kabell, Timothy Ohdin and Per Hansson. They have started a crafts collective and are building a large workshop with the help of their jointly owned sawmill from Logosol. All three of them are trained boat builders, but today they work with maintenance and restoration of old houses. 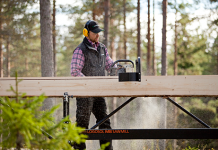 “As a boat builder you have to be very careful, or it will start leaking”, says Per Hansson. This accuracy is equally important when renovating old houses. Together they are building a large two-storeyed workshop with a bottom-floor area of 7 x 20 metres. 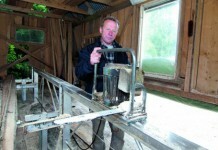 It will also be used for demonstrating old building methods. 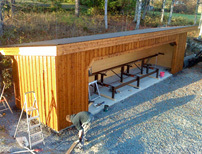 The house is being built in the village Unnaryd, which lies in the forests of southern Sweden. It is a post-and-plank house, a building method that was used by the Vikings. It reminds you of half-timbered houses. 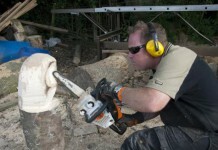 This method is suitable for a Logosol sawmill. 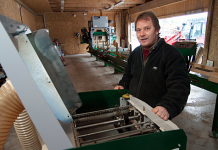 The three boat builders have produced most of the timber on their own, but they have also been helped by an experienced sawyer, and he too has a Logosol sawmill. The building project is interesting in several ways. If we start with the frame, the longitudinal beams stretch from one side of the house to the other. Their length is 20 metres. They are made of several beams that have been joined together using an old method with self-locking hooks that are just as strong as the beams. But the biggest challenge is the actual workshop with the dimensions 7 x 8 metres. The second floor has to stand heavy loads. 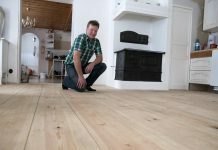 Here, they will store timber, and other heavy objects will perhaps also be placed on this floor. The joists between the floors must be extra strong. “We contacted a construction engineer who had a plan including steel beams. 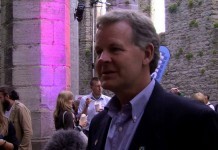 It was too expensive and space consuming,” says Johannes Kabell. 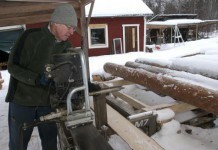 He found the solution in a German book on timber construction techniques from the 19th century. Two thick wooden beams are suspended in their ends to dry. The result is that the beams bend. Then hooks are cut out along the entire length of the beams, and finally they are joined together. The hooks are interlocking like cogwheels, locking the bent beam. Then they are fitted with the bend facing upwards. This type of beam becomes stronger than steel of the same dimensions. The building method used, means that you first raise standing beams with grooves in their sides. In the grooves you place boards, or in this case logs. The workshop will have four kinds of exterior walls, to show different possibilities. One is made of straight-sawn logs that have been hand-hewn, another is of machine-milled timber, the third is of standing panelling of different widths, and the fourth is of moulded standing panneling. The trio’s favourites are the hand-hewn log walls and the standing panelling of different widths. How is it that three young men are trained to become boat builders and work within the field of small-scale wood processing? Well, it is not as strange as it may seem. On one hand, it is a sign of the times. Several Swedish surveys show that more and more young people dream of a life closer to nature. Old crafts of all kinds have come back. On the other hand, there is often an older generation that inspires and helps out. This is also true in this case. Johannes’s father is Sören Kabell, a legend within Swedish forestry and founder of the biggest forestry exhibition in the world, Elmia Wood. “I’m impressed by the things the guys produce,” says Sören when he walks around in the workshop. Their results receive full marks. Nothing else is to expect from a proud father, but Fresh Cut’s correspondent verifies that this is true even for a neutral eye.